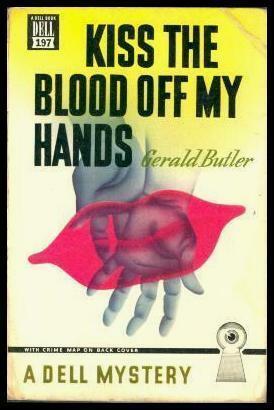 Gerald Butler (1907-1988), a British author who has almost completely faded from view, published Kiss the Blood off My Hands in 1940. I could find almost no biographical information on this mostly forgotten author and searches turn up the actor Gerard Butler. Kiss the Blood off My Hand is a very dark classic noir novel which was made into a 1948 film of the same name starring Burt Lancaster and Joan Fontaine. The book’s title is intriguing–partly for the graphic images conjured into view, but the title has a much deeper meaning which includes redemption and forgiveness for violence through the healing powers of love. Kiss the Blood Off My Hands was a bestseller in its day with sales of over 250,000 in hardback, and that’s probably why there are used copies still out there. By the time I’ve been blotting up beer for a couple of hours, any fellow who starts anything with me is crazy. Although maybe I hit him harder than I meant, or maybe he hit his head as he went over, or something, but he looked like a chap who would want plenty of jab, and that isn’t the way he looks on the floor. He looks pretty still. He looks damned still. Come to think of it he looks too damned still. The whole pub had dried up like a scab. The place was so quiet you could hear a cat mess. Our protagonist calls himself Bill Saunders, but there’s every indication that this name is fictitious. There are also indications that he is probably American as later on in the book, he passes himself off as Canadian. We don’t know how he came to Britain and we know almost nothing about his past, but we do know that he reacts to most situations with violence, he’s a brutal criminal and as clichéd as it sounds, his fists are deadly weapons. This sort of anonymity is a continued theme throughout the book, and even though it was published in 1940, it may be set in the 30s, pre WWII since there’s no backdrop of war (significant given the ending). The anonymity of time, place and people is underscored by the way Bill objectifies his surroundings and the humans in that space. To him people are objects to be exploited, and if they’re in his way, then they’d better move aside or take the consequences. While Bill appears to have no past, we know that his background can’t have been pleasant. His emotions are all wrong, and he doesn’t even know the word for love when he finds himself unexpectedly falling for an unusual woman. Fleeing from the pub in this unknown, unnamed town, fate throws Bill into the path of a young woman named Jane who works as a shop assistant. Needing a place to hide, he shoves Jane inside her flat and decides to lay low there for the next 24 hours. Bill knows that what happens to Jane depends on whether or not she stays quiet. While he identifies Jane as not a “tart,” the sort of woman he’s more used to dealing with, he’s not exactly sure how to handle her. She seems like a new species as she doesn’t react to his threats the way she’s supposed to. The girl was pretty. Her eyes were bright, and somewhere around her mouth there was a curious tilt that made her look all the time as if she was going to smile. I wished to hell she was a man. You can sock a man to teach him to keep quiet, but with a girl that would just be asking for noise. “Nobody frightens me,” I started, but I stopped because I guessed she must be kidding. While Bill tries to “puzzle her out,” he realizes that she’s different. She doesn’t panic or cave when he bullies or threatens her, and she even makes a few demands of her own. She got up and stood by the washbasin near the window, and pointed to the far wall. “Go and admire the wall paper,” she said. I went over and sat on the bed facing the wall. Something whistled over my head, and yesterday’s paper dropped at my feet. I picked it up and started to look at it. She was tidying up, getting ready for the day. I could hear the running of water, and then after a bit–I think she hesitated a bit–I could hear the rustle of clothes coming off. “Don’t look around she said. “Don’t worry,” I told her. That was easy enough for me. That kind of thing never did anything for me. There was a time and a place for that with me, and there was a kind of woman to do it with, and that kind of woman wasn’t her. An awkward relationship begins between Bill and “kid” (as he calls Jane), and it’s a strange relationship based on her thinking he’s a decent human being, and him not understanding the attraction, but grasping that he should behave when they’re together. It’s later, not much later, we realize just how ugly and violent Bill can be…. Quite soon. No putting it off. You can’t choose the day. You can’t wait and pick the day when you feel like it. This is their show. They do the choosing. They do everything. You’re just the thing they do it with. But it’s only the damned powerless feeling, that’s all. They usually scream, do they? Just mugs. They’ve screamed when I’ve hit them, but they’ve never really hurt me. They’ve picked the wrong one this time. They can knock me silly but they can’t hurt me. Not the way they mean. The footsteps clatter along the passage. Now for it. Here goes. Brace yourself. Stop those silly doubts from flashing across your mind. The stories about it are all the same. It isn’t any picnic. So brace yourself. face up, that’s the thing. This passage (and I’ve only included part of it) reveals more about Bill than any stories he could tell. This is a man who’s no stranger to institutions, and once faced with the chilling violence of the state, he’s diminished and yet oddly brave even as he tries to maintain his usual bullying tough exterior. The novel’s big question seems to be ‘can Bill be rehabilitated’? But since this is noir, the underlying issue is will fate work against Bill’s attempts to lead a straight life? Kiss the Blood Off My Hands is a powerful story of the redemptive powers of love–a story in which love can heal but in this noir world in which we live, love isn’t powerful enough to face an unforgiving society full of opportunistic greedy men who are looking for the next easy buck. Butler seems to say that love cannot exist in this corrupt society, and this wonderful novel has a few unexpected twists and turns before arriving at its uneasy ending. You keep digging out forgotten Noir gems or am I just too ignorant of the genre to know it’s a famous book? It seems fascinating as it goes beyond the usual crime fiction. Did you decide to read this after watching the film? If you’ve seen it, is the film good compared to the book? No it’s obscure. The film is also out of print–although I’m sure someone is working on putting it back on DVD as it will be a hot title. This is part of my obsession with reading film source material, and the book is much much darker than the film. My respect for noir fiction knows no bounds. Amazing how someone can write a best seller, have their book turned into a movie, and still be forgotten almost within their own lifetime. I do not think that I ever caught the movie version of this. As you allude to, It looks like it was available on DVD but now it is difficult. yes it’s rather sad isn’t it? It’s surprising that the DVD is out of print as Burt Lancaster isn’t exactly a small Hollywood name. Have you by any chance seen Born to be Bad? It’s a favourite of mine with Fontaine, of course. Peel back the sticky sweet surface, and she’s pure viper underneath. No, I haven’t, Guy, but I clearly need to. It gives you a whole new impression of the actress. Plus how can you pass up the title? Danielle always digs out “forgotten women writers” and I just commented the other day that there must probabaly be as many “forgotten” men. This certainly is one of those examples. Do you find that the noir books are always darker than the movies? yes noir fiction is much darker–even Strangers on a Train (which I thought was a dark film) was much darker in the original material. There’s a scene in Kiss the Blood off my Hands involving a prostitute which was so nasty, so cold. There wouldn’t have been any point in even trying to get that past the film censors. And that’s the point, I think, film censorship plays a huge role in this. French film of the same period will tackle issues that puritanical American censors would not. It’s funny though because while American censors would let police corruption slip by, British censors would not allow any signalment of police corruption. It is remarkable how writers can be forgotten. This: “The whole pub had dried up like a scab.” is a damn good line. Bit less sure about this: “The place was so quiet you could hear a cat mess.” though. Still, it does sound very good. The story is very ugly in parts and even shocking in a few places, and the cat mess sort of shows how the man’s mind works.